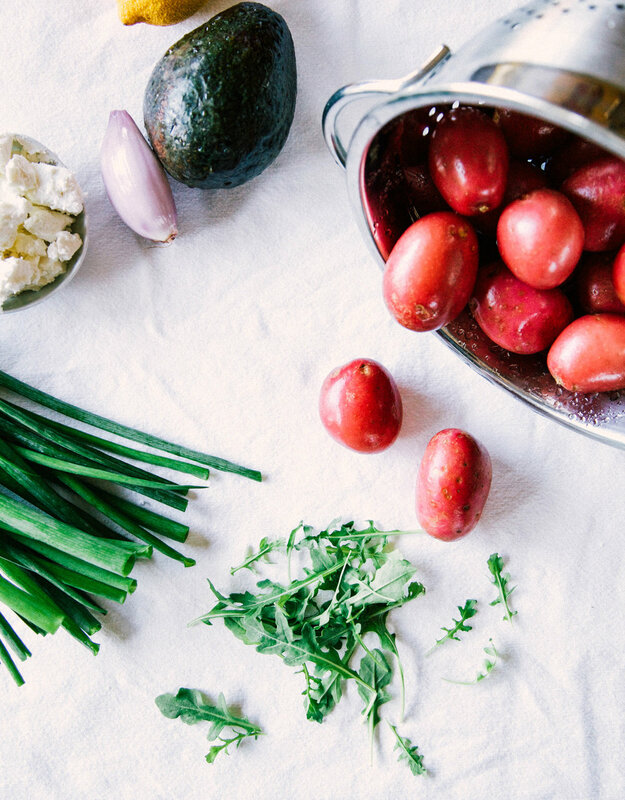 red potato, goat cheese & arugula salad. one of the tastiest things to come out of my kitchen this summer! i made this on a whim for some friends while we were on a trip this summer, and we were all loving itttt. so much flavor going on!! AND it has just 6 main ingredients. 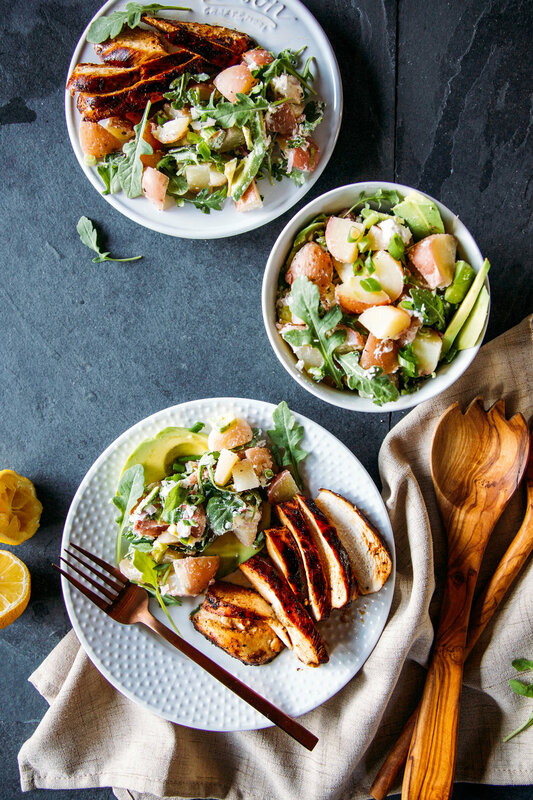 this potato salad is definitely customizable and would be delicious with bacon or prosciutto or something, byyy the wayyyy! once the potatoes are cooked and cooled, it is SO easy to put together. chopped tatoes, goat cheese, minced shallot, green onion, avocado, arugula, some lemon and salt & pepp to taste! 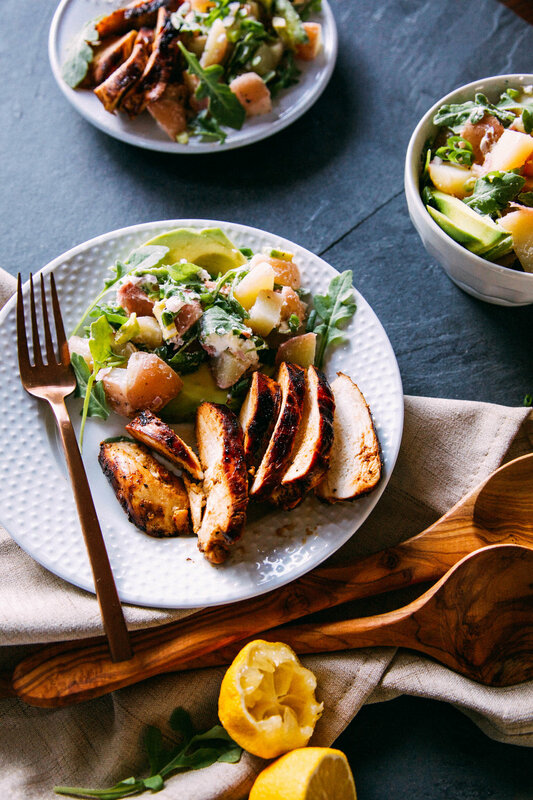 i would gladly eat the tato salad on its own for dinner...but for the sake of peter's meat-loving ways, i grilled up a chicken breast with just salt, garlic powder, pepper and a drizzle of honey. i love how the honey adds a nice almost-blackened skin with a subtle sweet but mostly savory flavor. goat cheese really does the trick if you're used to a mayo-based potato salad. no mayo allowed in myyy tater salads, tell you wHat. i mean, i'll eat em. but sometimes there's just sooo much mayo its crazy. the goat cheese & avo textures together are just perfect! Wash the potatoes and place in a pot of boiling water for about 10-12 minutes, until tender but not mushy. Drain the water and place the potatoes in a bowl in the fridge to chill, about 20 minutes. While potatoes are chilling, mince the shallot, chop the green onion and dice the avocado. Once potatoes are cooled, dice them into bite-sized chunks and add to a large bowl with the shallot, goat cheese, salt & pepper. Toss gently to coat the potatoes. Add the roughly chopped arugula, green onion, and avocado. Squeeze half a lemon over the top. Gently toss to combine all ingredients. Serve immediately or store in an airtight container in the fridge up to 2 days. Pair with grilled chicken or any protein you like!